According to the official website for Secunia PSI, version 3.0, available from MajorGeeks below, is the last version available, and all existing installations of PSI will stop working in 2018. See our list of the best free software updaters for some free PSI alternatives, like Patch My PC. 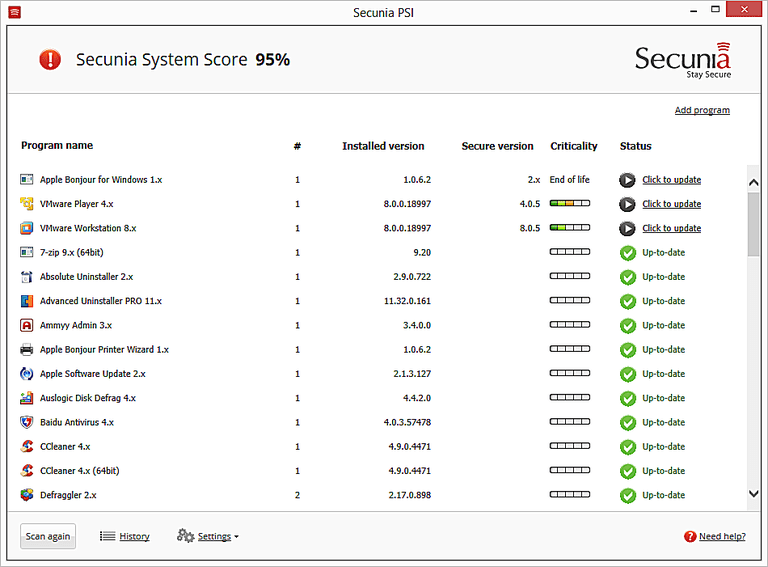 Secunia PSI (Personal Software Inspector) is a really simple and completely free software updater. It identifies insecure programs you might have installed and then provides an easy way to update them to patch the vulnerabilities. Secunia PSI is a unique program because is seems to miss updates that other software updaters detect, but it also shows updates that other tools miss. While testing Secunia PSI, it was able to update Flash, Java, iTunes, QuickTime, and other programs completely automatically and without any intervention on my part, which was really great. Unfortunately, it also missed a handful of programs that other tools I used detected as needing an update. Because Secunia PSI only updates programs that require a security fix, you shouldn't use it as your main tool for updating everyday programs. Instead, I recommend using it after working with another software updater so you can be sure all your applications are secure. Secunia PSI fixes security vulnerabilities automatically, so there's really no real need to think about it after you've installed it.